The Fall 2018 meeting of the Society for Chemical Hazard Communication (SCHC) was held on September 22-26 in Washington DC, and VelocityEHS was on-hand for the morning of Tuesday September 25th as SCHC hosted several presentations covering the latest regulatory developments surrounding HazCom, WHMIS 2015, GHS and the recently amended Toxic Substances Control Act (TSCA). Here, we’ll recap some of the most valuable topics discussed by officials from OSHA, Health Canada, EPA and other leading experts in the field of chemical hazard communication. Minimum Risk Pesticides – “minimum risk pesticides” fall under the definition of a pesticide as defined in the Federal Insecticide, Fungicide and Rodenticide Act (FIFRA), and are therefore subject to EPA labeling requirements. Spray Adjuvants – spray adjuvants are substances added to a pesticide or pesticide spray mixture to enhance the pesticide’s performance and/or the physical properties of spray mixtures. OSHA has established that if a spray adjuvant is not subject to FIFRA regulation, then it must be accompanied by HazCom-compliant container labels. DOT-39 Type Cylinders – DOT-39 type cylinders are non-refillable compressed gas cylinders typically used for consumer propane/butane, refrigerants and other similar applications. OSHA has stated that HazCom does not require GHS pictograms to be printed on the cylinder. Rather, manufacturers may use adhesive stickers or affixed tags. In the case that the cylinder is affixed to an outer box which cannot be separated during use, OSHA considers the box to function as a “tag” which must feature all HazCom-required shipped label information. Dr. Kim Godard, Director at Health Canada delivered an update on the current state of Canada’s WHMIS 2015 hazard communication standard. Implementation of WHMIS 2015 is currently underway in Canada, with requirements for hazardous product manufacturers and importers having come into force on June 1, 2018, and those for distributors having gone into effect on September 1, 2018. The final phase of WHMIS 2015 implementation will require employers throughout Canada to be in compliance by December 1, 2018. Dr. Godard also presented the results of Health Canada’s recent Safety Data Sheet Audit Project. The audit looked at 188 publically available SDSs selected from manufacturers spread across multiple provincial and territorial jurisdictions, and which covered a variety of product hazards. These SDSs were then assessed for compliance with the requirements of the Hazardous Products Act (HPA) and Hazardous Products Regulation (HPR). The audit looked specifically at the presence, completeness, ambiguity and accuracy of hazard information contained in the various sections of the new 16 section GHS SDS format, and discovered some surprising results. Despite manufacturer/importer requirements to provide WHMIS 2015 compliant SDSs after the June 1, 2018 deadline, Health Canada’s SDS audit showed that 98.4% of SDSs reviewed were found to contain at least one non-compliance. In fact, approximately 5,000 non-compliances were identified among the 188 SDSs reviewed. That’s an average of 25 non-compliances per SDS! Figure 1 below is a slide from Dr. Godard’s SCHC presentation that shows a breakdown of the non-compliances that were identified. This table shows the percentage of SDSs containing non-compliances for each of the 12 required SDS sections (Health Canada does not require suppliers to provide information in sections 12-15 of the SDS). The greatest percentage of non-compliances were found in section 9 (physical and chemical properties) and section 2 (hazard identification), sections that are both critical for understand the hazards of a given product. The lowest percentage of non-compliances were found in section 4 (first aid measures), yet more than 50% of the 188 SDSs reviewed still contained errors within this section. The vast majority of non-compliances revealed were due to poor consistency or specificity of hazard information on SDSs, further highlighting the need for more accurate, reliable and high-quality SDS authoring in order to prevent these errors. Dr. Godard also noted that, even though they are required under the provisions of the HPR, French language translations of many of the 188 SDSs reviewed during the audit were not available. For the immediate future, Dr. Godard stated that Health Canada will assume a more collaborative approach to enforcement when dealing with suppliers whose SDSs are out of compliance, offering guidance and resources to help them get up to speed with the HPR and WHMIS 2015 requirements. Dr. Godard concluded her presentation with a discussion of Health Canada’s current and upcoming regulatory initiatives, including its intention to ultimately align WHMIS with Revision 7 of the GHS, ongoing efforts to modernize the Hazardous Material Information Review Act (HMIRA), and plans for later this year to resolve pending CBI claims and issue reimbursements for outstanding claim application fees following Health Canada’s April 2018 HPR amendments. GHS Revision 8 – a summary of sub-committee and working group activities regarding shipped label requirements for small containers, dust explosion hazards, non-animal testing methodologies, improvements and clarifications to medical statements on SDSs, and practical classification issues (PCI) for chemical specific target organ toxicity (STOT), explosives and chemicals under pressure. Appendix B - Additions to physical hazard criteria for flammable gasses, desensitized explosives and aerosols. While Health Canada has not set forth a target date for aligning WHMIS with GHS Revision 7, OSHA has tentatively scheduled its first notice of proposed rulemaking (NPRM) for February, 2019. When discussing the last point, Dr. Henry emphasized the importance of having all the relevant information about the chemical properly organized and included with the initial review submission, in order to ensure the process is as timely and efficient as possible. The chemical manufacturer’s obligation to notify users of the SNUR status of substances they provide to them, and the option for buyers of a chemical substance with a confidential identity to seek certification from supplier that their intended use is not a significant new use. Function of COs under Section 5(e) of TSCA, which can include requirements for testing, use of worker personal protective equipment (PPE), new chemical exposure limits (NCELs) for worker protection, hazard communication language, distribution and use restrictions, restrictions on releases to air, water, or land, and recordkeeping requirements. Dr. Passarella stressed that although suppliers are obligated to tell customers about SNURs, the information can sometimes get “lost” due to business changes such as mergers, acquisitions, and divestures, so it’s important for downstream users to ask for this information. Arguably, the most broadly applicable part of Dr. Passarella’s talk focused on the relationship between SNURs and SDS. As a reminder, Section 15 of the SDS is designated for “Regulatory Information,” and although chemical suppliers’ SDSs need to include the section number and heading on SDSs, they are not required to include information in this section. However, downstream users often rely on information contained in Section 15 to determine applicable regulatory requirements and safe handling practices. 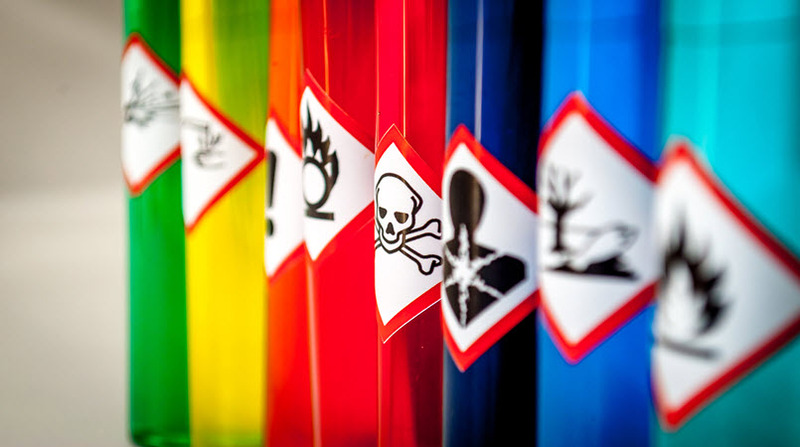 As a result of the ongoing review of chemicals under TSCA, information about chemicals such as their “active” or “inactive” chemical inventory status, associated SNURs, or identification of risks and exposure controls may change. Section 15 of the SDSs may be updated to reflect the new information. In some cases, EPA review may have implications for other SDS sections. For instance, EPA may request that PPE information in Section 8 of the SDS specifically state that “impervious” gloves be used for chemicals considered to pose skin irritation hazards. Dr. Passarella concluded that manufacturers need to take their obligations to downstream users seriously, especially in light of TSCA considerations. She strongly emphasized communication between all affected parties including OSHA, EPA and DOT, advised downstream users to be aware of TSCA information on SDSs concerning safe handling, storage and use, and to communicate with suppliers as necessary. With all of the changes happening to hazard communication and chemical safety standards in the United States, Canada and throughout the globe, it’s easy to see why so many businesses have a difficult time staying in compliance. MSDSonline SDS / Chemical Management Solutions from VelocityEHS give businesses like yours powerful and easy-to-use software tools that help simplify hazard communication and chemical safety compliance. Our award-winning MSDSonline HQ and HQ RegXR Accounts give you 24/7 mobile right-to-know access to the industry’s leading database of more than 14 million manufacturer-original SDSs, along with built-in workplace labeling capabilities and sophisticated chemical inventory management tools that make compliance with HazCom, WHMIS and other GHS-aligned hazard communication requirements faster and easier than ever before. VelocityEHS also offers a comprehensive suite of compliance services to help you take the guesswork out of hazard communication. Our expert SDS Authoring and Regulatory Consulting Services including SDS Translation, Confidential Business Information (CBI)/Trade Secret Claim Support, and SDS Compliance Check will help you rest assured that your SDSs and other hazard communication information is up-to-date and 100% in compliance. It’s why more than 13,000 customers and 8 Million users worldwide trust VelocityEHS to help them meet their hazard communication requirements and keep their workplaces safe. Visit our website at www.MSDSonline.com for additional free hazard communication and chemical safety resources, and to learn more about our award winning SDS / chemical management solutions.